The Wilderness Medical Society held its annual meeting at Snowmass last summer July 23-28, 2010. There were numerous terrific educational sessions. In a series of posts, I am going to highlight some of what we learned from the presenters. Approximately 15 percent of the 3,000 snake species worldwide are dangerous to humans. There are annually 400,000 to 2,000,000 envenomations from snakebite worldwide, with 20,000 to 100,000 deaths. In the U.S., there is at least one species of venomous snake in every state except Alaska, Maine, and Hawaii. There are approximately 20 venomous species, including pit vipers and coral snakes, and an estimated 6,000 to 7,000 venomous snakebites each year, including six to 10 deaths. Perhaps only 20 percent of bites are reported. Deaths from snakebites typically occur in elder victims, in victims who do not receive antivenom or in victims who receive inadequate amounts of antivenom. Ninety-eight percent of bites are on the victim’s limbs, usually the arms or hands. 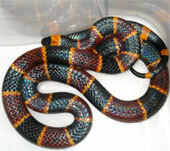 Venomous coral snakes in North America can be recognized by the pattern of red bands bordered by yellow bands. “Red on yellow, kill a fellow; red on black, venom lack.” The venom of the Texas coral snake is generally less toxic than that of the Eastern coral snake (pictured above). The Sonoran coral snake is small; the limited volume of venom it can deliver makes its bite relatively insignificant. Because a significant coral snake envenomation can have serious symptoms that are delayed or gradual in onset, anyone who has a suspected coral snake bite should be transported to appropriate medical care (typically, an emergency department) even if no signs or symptoms are present. If a person has been bitten by an Eastern coral snake and has any sign of neurotoxicity, antivenom should be administered as soon as possible. North American Coral Snake Antivenom (NACSA) is produced by Wyeth; production ceased in 2006, so very little of this product is available. A Mexican product, Coralmyn, which is effective against both the Eastern and Texas coral snakes, is not available in the U.S. Antivenom is usually not needed for most bites from the less toxic Texas coral snake, and supportive care alone without antivenom is the appropriate therapy for Sonoran coral snake bite. Crotalid snakes (such as rattlesnakes) have fangs with a deep groove through which venom flows. The fangs can be folded into the snake’s mouth, or hyperextended up to 180 degrees. The fangs move independent of each other, and the snake can control whether or not to inject venom and how much to inject. The venom of crotalids varies between species, can vary within a species, and is very stable to temperature changes and drying. One quarter of all pit viper bites are “dry” and do not result in envenomation. When envenomation does occur, you’ll notice pain, redness and swelling near the bite site occurring within 30 to 60 minutes. Over several hours, blisters (often bloody) occur, sometimes with inflammation in the lymphatic system. In three to six hours, there can be extensive bruising. When someone is bitten by a crotalid snake, one should limit motion of the bitten part (such as by using a splint), try to limit walking, remove jewelry and constrictive clothing that might cut off circulation if swelling were to occur, and use acetaminophen for pain. The next step is to transport the victim to the emergency department. Useless and potentially harmful first aid maneuvers include tight tourniquets, incision and suction, venom extraction devices, electric shock, immersion into crushed or cubed ice or ice water, and application of papain or meat tenderizer. A severe allergic reaction may occur following a snakebite. This is treated in standard fashion with drugs such as epinephrine, antihistamines, and steroids. Exotic snakes imported into the U.S. can certainly bite victims. The symptoms of envenomation are often different than those from North American venomous snakes, and include flaccid (“floppy”) paralysis, muscle tissue breakdown, severe bleeding disorder, kidney failure, tissue death at the bite site, infection or abscess at the bite site, and allergic reactions. This post, What You Need To Know About Snakebites, was originally published on Healthine.com by Paul Auerbach, M.D..